Leadership may be one of the most challenging tasks any human being ever takes on. Leaders lead from the front and there may be no more exposed and vulnerable position to be in. As a result, many leaders end up leading out of fear. This is an extremely ineffective way of leading, however, and can actually do more harm than good. 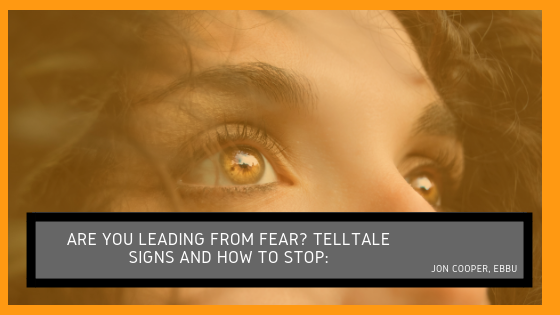 Here are three traits of fear-based leaders and how to overcome them. Image managers are far more concerned about how they look than about performance. Whenever anything goes wrong, they immediately start looking around for someone else to blame. When things go right, however, the image manager will immediately make sure the spotlight is on them, so they get all the glory. The way to stop being an image manager is to remember that you look good when your team looks good and you look even better when you take responsibility when things go wrong. Problems have a tendency to get solved a lot faster when you stop wasting time looking for someone to blame and just focus on solving the problem. The control freak is terrified of allowing anyone to make a decision they don’t personally sign off on. They need the entire team to do things their way because they are convinced their way is the best or most efficient. The more freedom you can give employees and subordinates to manage their own responsibilities, however, the more effective you might find them to be. One of the best ways to help curb controlling tendencies is to establish clear boundaries. Even bosses and supervisors need to have designated lanes in order to help them stay within them. Dr. Doom is far more concerned with what can go wrong than with what can go right. These leaders are highly risk-averse, which means they refuse to try new things. As a result, they often hinder growth and create a stagnant environment. The best way to stop being Dr. Doom is to set strategic goals and implement them carefully. You don’t have to leap without looking, but you need to make a plan and regularly take careful, conscious “bunny hops” of faith.